TH E M R EP O RT | 7 SPONSORED CONTENT By Dustin Sauter W e are all familiar with the saying "Which came first? The chicken or the egg?" but what you might not realize is that this grade school saying perfectly illustrates a problem organizations struggle with when implementing or optimizing business processes. Let's assume you are a busi - ness leader, and you have process problems. Like others in your field, you understand that your staff is spending too much time completing manual tasks that could be automated, that you lack visibility into your op - erations, that you can't pinpoint where performance problems are, and you can't grow your business without growing your headcount. Left, right, front, and center, you have process problems that are preventing you from being more efficient and from focusing on the core com - petency of your business. In these situations, the first question facing any leader is: do I find a process software solution first, or do I design my ideal pro - cess first? This isn't just a problem with organizations that have no existing processes; at OrangeGrid we also see this question be - ing asked by businesses that are migrating from another system to our platform. As is the case with most things in life, the answer isn't as simple as black and white. The real answer is: it depends. Luckily there are some things you can consider that will help you answer the question in a way that best fits your business: • Your process choices are only as good as your tools. 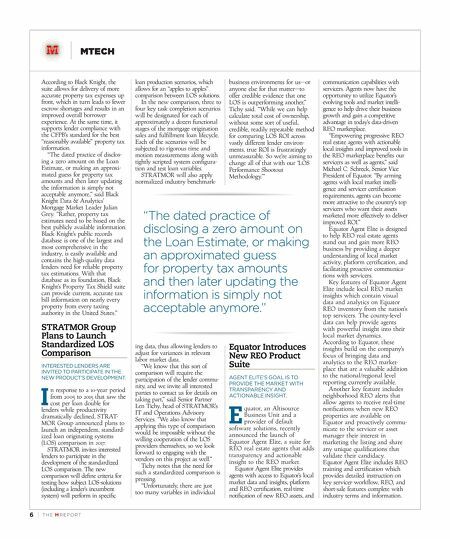 I'm sure that, at one time, everyone reading this article had a great idea but found that due to a lack of tools or resources their idea had to be scaled back or process software solution as an opportunity to refine and craft your processes to use the ad - vanced features of the system, such as rule-based decisioning and redundant task automa- tion. Be careful though; it's easy to get analysis paralysis when implementing a new system and overhauling your process. • Don't underestimate the value of incremental lift. We often take an all or nothing approach when it comes to delivering change to our organizations because, for the most part, this is how business has been conducted for eons. Within the last few years breaking large projects up into incremental delivery segments has become more and more common prac - tice. If done correctly, this ap- proach allows your business to address problems that are easier to tackle sooner, buying time to address the moderate and hard problems. Creating this con - veyor belt of change provides a constant stream of value until the objective is complete and helps you realize your return on investment sooner. Overhauling your process and implementing a process software solution is hard work. There are a lot of moving pieces. There are a lot of things to get wrong, and trust me you will get them wrong. But that's okay. If you have selected a flexible and configurable software solution bundled with implementation and operational support by busi - ness process practitioners like we do at OrangeGrid, your mistakes will be minimized and easy to fix when they do occur. I still can't tell you what comes first, process optimization or a process software solution, but hopefully you have a few handy tips that can help you determine the best path forward for your business. 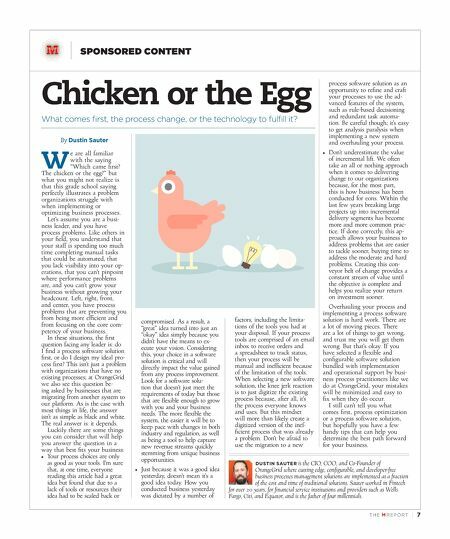 Chicken or the Egg What comes first, the process change, or the technology to fulfill it? compromised. As a result, a "great" idea turned into just an "okay" idea simply because you didn't have the means to ex - ecute your vision. Considering this, your choice in a software solution is critical and will directly impact the value gained from any process improvement. Look for a software solu - tion that doesn't just meet the requirements of today but those that are flexible enough to grow with you and your business needs. The more flexible the system, the easier it will be to keep pace with changes in both industry and regulation, as well as being a tool to help capture new revenue streams quickly stemming from unique business opportunities. • Just because it was a good idea yesterday, doesn't mean it's a good idea today. How you conducted business yesterday was dictated by a number of factors, including the limita - tions of the tools you had at your disposal. If your process tools are comprised of an email inbox to receive orders and a spreadsheet to track status, then your process will be manual and inefficient because of the limitation of the tools. When selecting a new software solution, the knee jerk reaction is to just digitize the existing process because, after all, it's the process everyone knows and uses. But this mindset will more than likely create a digitized version of the inef - ficient process that was already a problem. Don't be afraid to use the migration to a new DUSTIN SAUTER is the CIO, COO, and Co-Founder of OrangeGrid where cutting edge, configurable, and developer-free business processes management solutions are implemented at a fraction of the cost and time of traditional solutions. Sauter worked in Fintech for over 20 years, for financial service institutions and providers such as Wells Fargo, Citi, and Equator, and is the father of four millennials.